When I finished my latest sketchbook, it struck me how this particular set of drawings reflect changing seasons. The initial pages were drawn when the weather was still warm but not hot. People were romping about in shorts and light coloured tops and ordering cold citron tea, but Bingsu was on its way out from the menu and dainty looking Chuseok (Korean Thanksgiving)-themed goodies were filling up the shelves. Mid-sketchbook you see traces of fall – sketches of people facing or with their back against cafe windows that frame trees ablaze with the most brilliant shades of yellow and red. Temperatures drop but those in denial keep their hemlines low. The rest of us take refuge beneath light coats and wrap scarves around our necks. Hot chocolate drink starts to look tempting but is definitely a good fortnight or even a month away from being the undisputed object of desire. In the last couple of pages, winter arrives, but in phases. It starts innocently when a few woollen hats pop up on people’s heads here and there. Then with the first snowfall, out comes the cable knit sweaters, duffle coats and hooded parkas and finally on a day like today when it is -12 degrees outside I see people milling about in overcoats, oversized down jackets with faux fur trims, striped woollen mufflers, fitted cashmere blazers and distressed leather boots. And this is only the outermost layer. Some cafes have their heating so high that it prompts people to peel off their winter clothing layer upon layer as soon as they get seated until everyone has a small pile next to them or on the chair while others have the temperature setting so low that it makes sense to have everything on your body, even the backpack. See the last sketch. Office meeting in progress. Seen at Angel-in-us cafe, Seoul. (L) I once saw the most dedicated, zesty, sincere and patient tutor trying to teach the most distracted student who kept texting the entire time. Sipping the last dregs of Summer. Seen at Paris Baguette cafe. Fall colours outside the windows of Gontran Cherrier cafe, Seoul. Together yet distant. I drew this couple from the most coveted seat in Alver cafe, which is against a beautiful vertical garden. You can see some of it behind the lady. Winter brings out the puffy down jackets. (L) This lady bore an uncanny resemblance to the actor who played Mrs. Kim in Gilmore Girls! She had the same hairstyle, identical gait and spoke in similar staccato sentences. Keeping the backpack on for extra warmth. 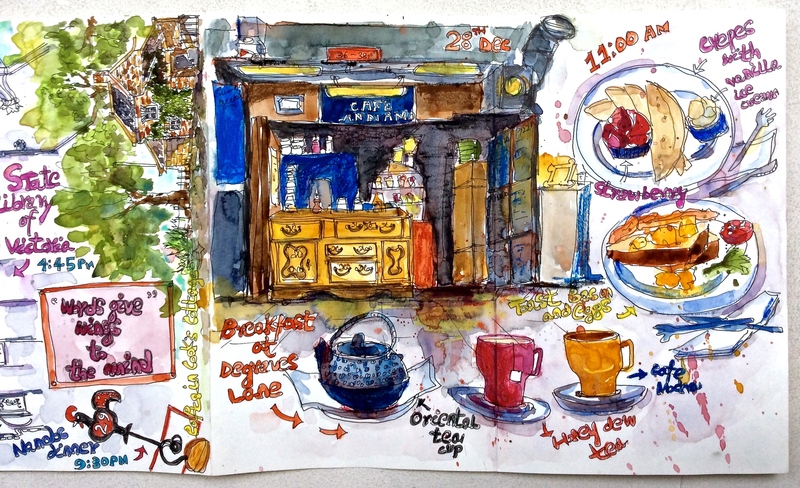 This entry was posted in Daily Vignettes, People Sketches and tagged art, cafes, drawing, drawing people, handdrawn, illustration, locationdrawing, observational drawing, peoplewatching, Seoul, Seoulcafe, sketch, sketchartist, sketching, sketchingpeople, Travel, urbansketcher, urbansketching, usk on December 12, 2017 by Somali Roy. are fascinating as are all shophouses in Singapore that thanks to the Urban Redevelopment Authority have been beautifully restored and are feast for the eyes! Yesterday I was here with a friend who I didn’t see for long and in the midst of catching up on life and such we both sketched. 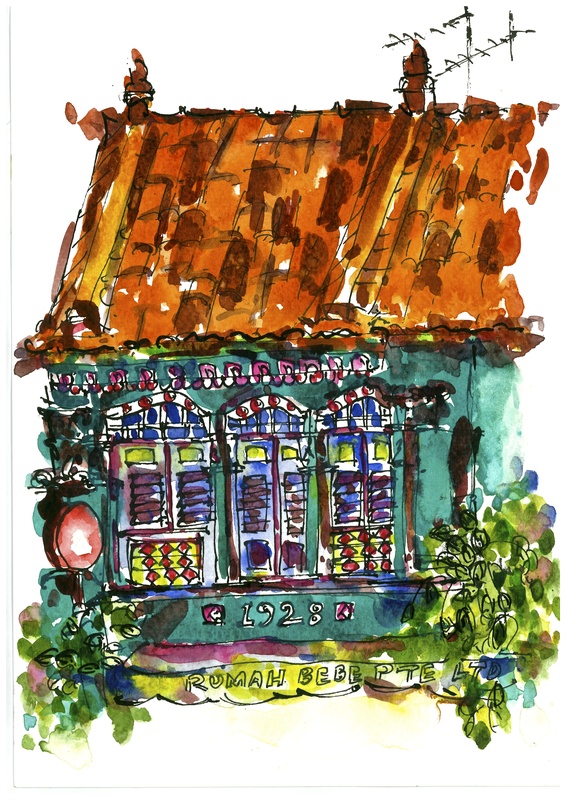 Above is my take on Craig Road shophouses sketched with a dip pen and brown ink and colored using watercolours. This isn’t my first sketch on Craig road and wouldn’t be my last but what’s interesting to note here is how each of these sketches have served as progress markers on my journey as an artist. And that is why when you look back and probably cringe at your last work – which I often do – you must turn around and forge ahead with gusto because even if it’s a slow and gradual process, growth is inevitable when you’re committed. This time I’m going to take my own advice. 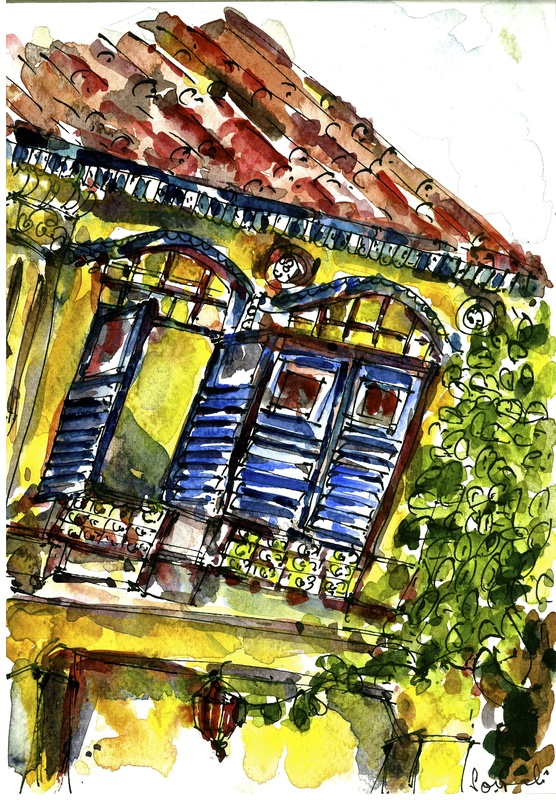 This entry was posted in Daily Vignettes, Shophouses and tagged Craig Road, drawing, illustration, Shophouses, Singapore, sketch, sketching, urban sketching on September 9, 2016 by Somali Roy. are the ones that keep me occupied for hours. 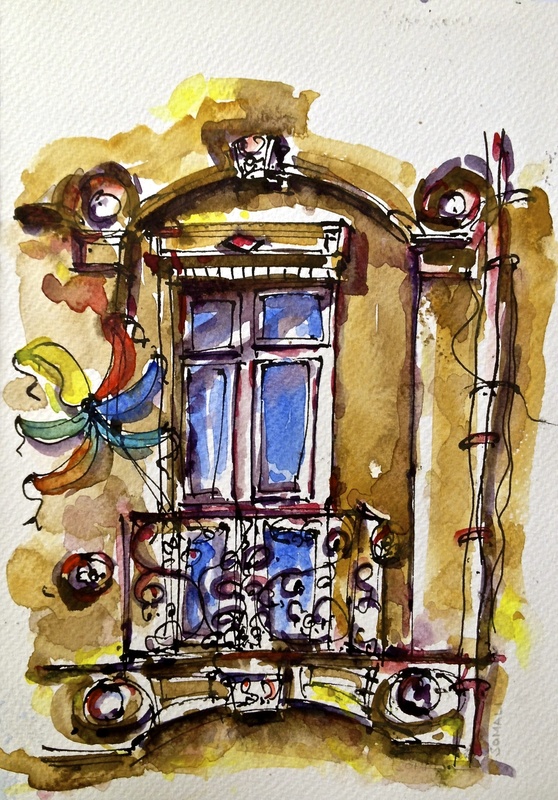 If you’ve read my earlier post – Had people watching – you must be aware of my penchant for practicing flânerie, especially at cafes and how I channel my people watching / observation skills into making art. So far it’s been fun! 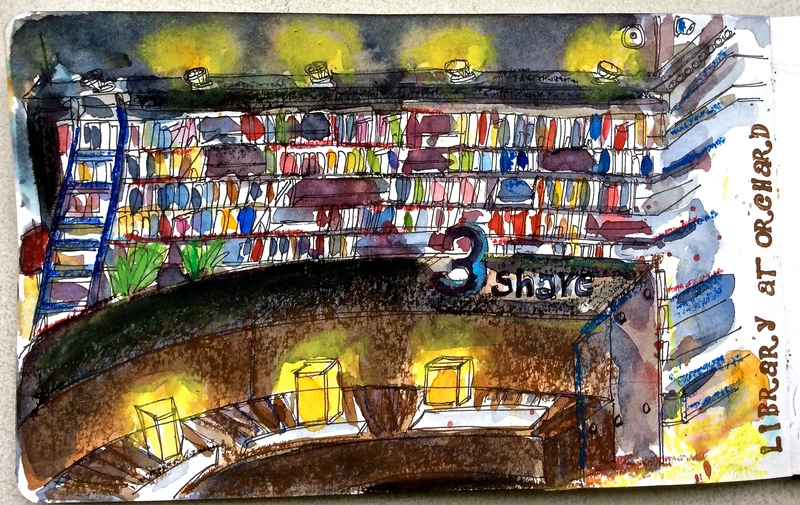 Sketching is a mindful exercise and extremely gratifying, but sketching people is enlivening. There isn’t a moment of dullness or monotony because no two people you sketch can be alike. They differ not just in their attire and mannerisms but also in their interaction with/reaction to their surroundings. This couple started out acting all lovey-dovey, listening to the same music, leaning on each other, holding hands and then everything went downhill from there in the next 10 mins until one of them stormed out. Ah, the capriciousness of love. These people captured in my sketchbook can be generically labelled as say, the coffee drinkers of Singapore because that’s what they’re technically there for but that’s not the only thing they do or if you’re observant enough, that’s not the only thing you see them doing. I once sketched a chain-smoker with a lot of swagger sipping coffee and blowing smoke into the ‘No smoking ‘ sign right next to him. Two very fashionable ladies and a guy sitting in between them with hand on his head. One of the women was ranting in Japanese and the two were mostly zoned out, I think. That same week I had also sketched a girl who was part of big group that ate and drank quite liberally at the cafe but right before leaving she was the only person who cleared every bit of trash on their messy table before walking out. This bunch of pimply faced boys were from Anglo Chinese School and were studying ‘O level Topical Physics’ at Starbucks. They were all plugged in to their phones, swinging shoulders from time to time and sipping Macha lattes. These surely are different times! With each sketch I get to peep into a stranger’s life for few minutes and capture them living an ordinary moment which otherwise would have gone unnoticed, unaccounted for. For example the Chinese grandma wearing jade bangles and a frumpy top on what seemed like her first trip to Starbucks was another fun subject to sketch. (L) This cute grandma had a strident voice, a blue clamp holding her red hair and jade bangles around her frail wrists. From the way she surveyed the place and the patrons sitting around her from time to time and inspected her cup of latte, it seemed like her first time here at our neighbourhood Starbucks. Don’t miss her colourful shopping trolley! She looked out of place and excited at the same time to be holding probably her first cup of latte in her wrinkled hand. She may never know this, but 2 meters away I was touched to have witnessed that moment and document it in my sketchbook. It was really hard to believe that this guy was eating Tiong Bahru Bakery’s Kouign Amann ( which by the way is top notch) with such indifference. All sorts of students, specially pimply restless school students plugged in to their music sipping frothy matcha latte are common sight at the local Starbucks and always make great subjects for drawing. (L) – Serious discussion taking place. The guy in the centre doesn’t look amused and kept quiet through the entire conversation. You see them day and night hunched over a pile of books, fervently highlighting something or the other with coloured markers on their notebooks with their laptops open on the side. 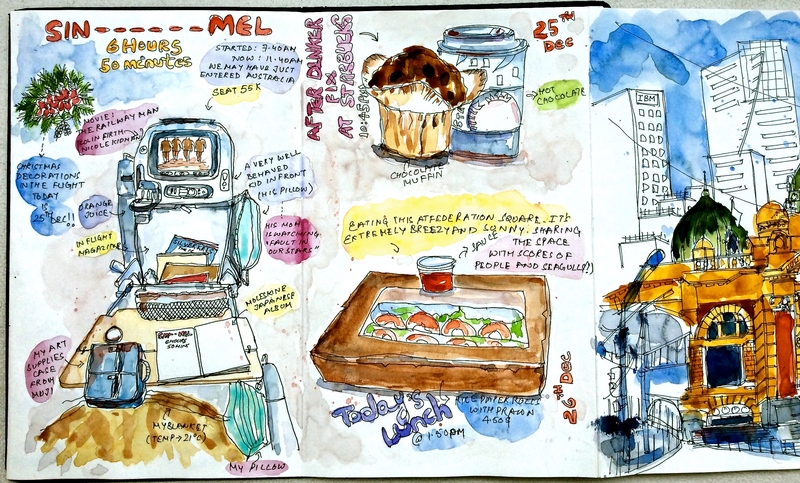 This subculture is unique to Singapore, something I haven’t witnessed in any other country I’ve travelled to and therefore having them in my sketchbook is also special. (R) The rare sight of someone reading a physical book and then looking up to think about and then reading again. That’s an indie comic book in her hand and a guitar by her side. It’s hard to imagine that only three months ago I had this incredible fear of drawing people which I write about in the post What if and how I get over it and now have come to enjoy it because it feels as if for once I’m not rushing through life and letting it pass by me but consciously stopping to smell the flowers. (L)- This woman had an impermanent tattoo on her hand. The word ‘Love’ written in bold with a glitter pen stood out and and yet seemed incongruous with her austere style. She was alone and seemed lost in thoughts. (R) – I spotted these two women on a late Sunday night. They were mostly gregarious but at one point I saw one of them point finger at the other in a menacing way. Well, I don’t know where it’s going to take me and if anything will come out of this but as long as I cherish these little stolen moments and revel in the ordinary stories of ordinary people, I will continue to document them in sketchbooks and share with you. Hope you can stop by! (L)- A chain smoker with a lot of swagger. He didn’t care about the ‘No Smoking’ sign next to him; (R) – My husband reading ‘Harry Potter and the Cursed Child’ on the day it got released. 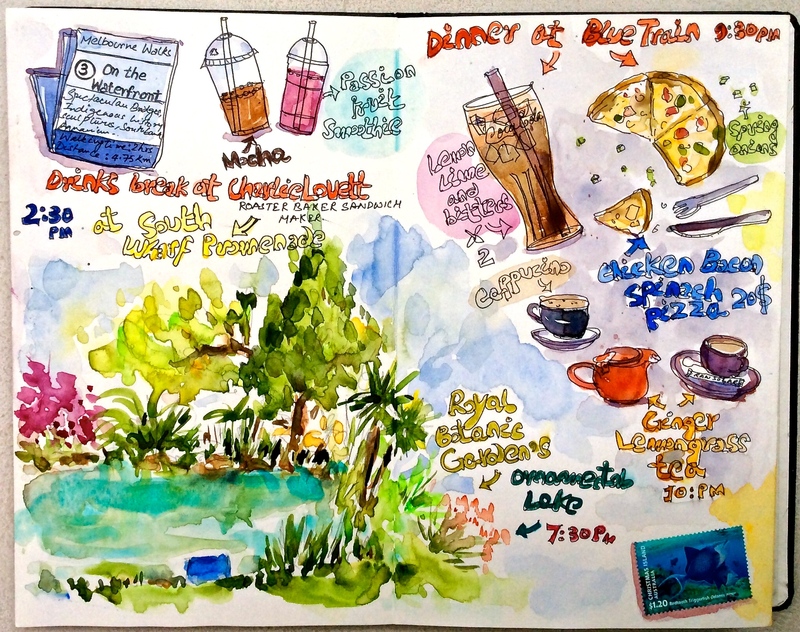 This entry was posted in Daily Vignettes, People Sketches and tagged art, cafe, cafe illustration, Cafe sketching, coffeedrinkers, drawing, illustration, ordinarypeople, peoplewatching, Singapore, Singapore people, singaporecafes, sketch, sketching, Starbucks, Travel, urban sketching on September 7, 2016 by Somali Roy. Having tackled the drudgery of life for an entire year (also known as living!) we decided to get our lungs some antipodean air and come back ably renewed and refreshed to pick up the yoke of 2015. By the way, Happy New Year folks! That innocent decision birthed in a moment of romantic wanderlust was followed by endless reading, preparing, planning, discussing, arguing, booking, packing and apprehending. The process was tedious and grossly unromantic. But we didn’t give up. Not because the smell of adventure kindled our vigour. The flight tickets were non-refundable. Front cover of my trusty Moleskine Japanese Album. I gave it a facelift! When things started falling in place, this is what the itinerary looked like : We’d spend 25th Dec to 31st Dec in Melbourne and Sydney, Australia and from 1st Jan to 10th Jan we will hire a car and drive around scenic routes in the South Island of New Zealand. So naturally, even before deciding what to wear, my one track mind was thinking of ways to capture the experience in pages. It made lofty promises of filling sketchbooks and loose sheets with astounding art and demanded I buy suitable art supplies to be able to achieve that. We debated day and night, weighed pros and cons, charged each other with a salvo of arguments, defended with smart retorts. It wasn’t easy. ( Yes, I have a fertile imagination and a very active inner dialogue). But we came to a decision. 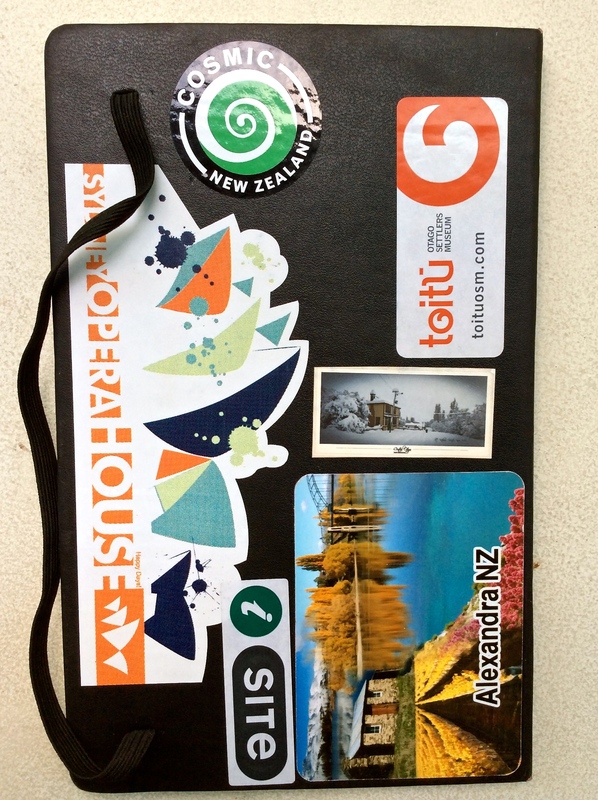 Back cover of my Japanese Album decorated with stickers I collected from various locations – some bought, some handed for free by museums, souvenir shops, tourist info centres who thought it was ‘such a neat idea’! It would have to be Moleskine’s Japanese Album with 50 pages, 165gsm. It ticked almost all the boxes. The idea was to carry something handy that fits in the bag easily, isn’t heavy and definitely not intimidating for my subjects. A smaller page would also mean lesser time investment when filling it. But most of all, I was hunting for something, where I could illustrate the entire trip, the whole 19 days in one continuous sheet of paper, where daily events can merge into one another and the observer can see everything without having to turn the page! Wouldn’t that be fun! As you can see from the picture below, the Japanese Album fits the bill! The only quibble is that the paper isn’t great for watercolours, but accepts light washes. I took that in my stride coz, the aim was not to produce elaborate frame worthy paintings, but to document the journey by illustrating my thoughts, misgivings, explorations, observations. 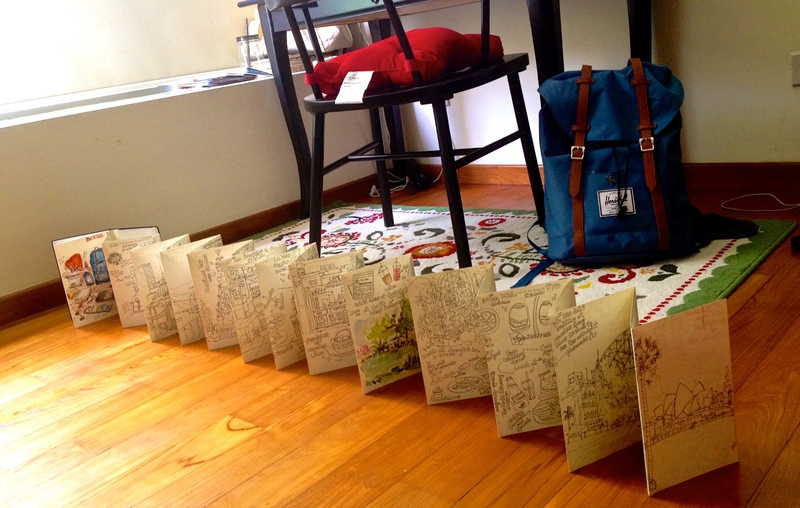 I unfolded the sketchbook and laid it on the floor of my study. 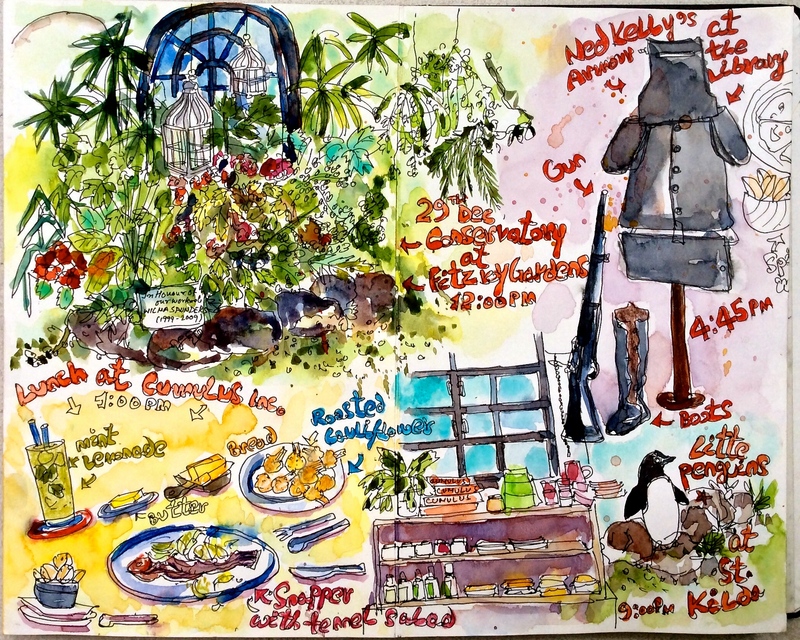 I documented every single day on the trip starting 25th December 2014 and ending on 12th January 2015. It took a bit of getting used to initially both for me and my husband until with a bit of discipline it became second nature. Every single morning I’d sense the potent urge to record my observations for that day and my travel partner would learn to give me time and space, sometimes patiently lingering in the background or finding things to do on his own. In that sense, the 50 pages worth of memories that I hold in my hand is a collaboration. 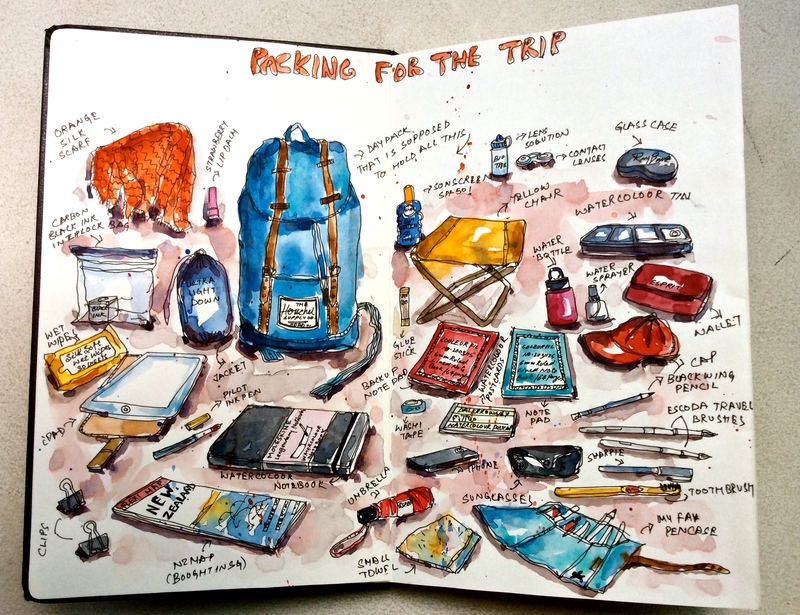 In the first two pages I drew every single item that went inside my blue Herschel daypack that I carried on the trip, for sketching on the go. It weighed slightly less than 5Kgs, although I learnt to downsize based on what I wanted to carry on a particular day. 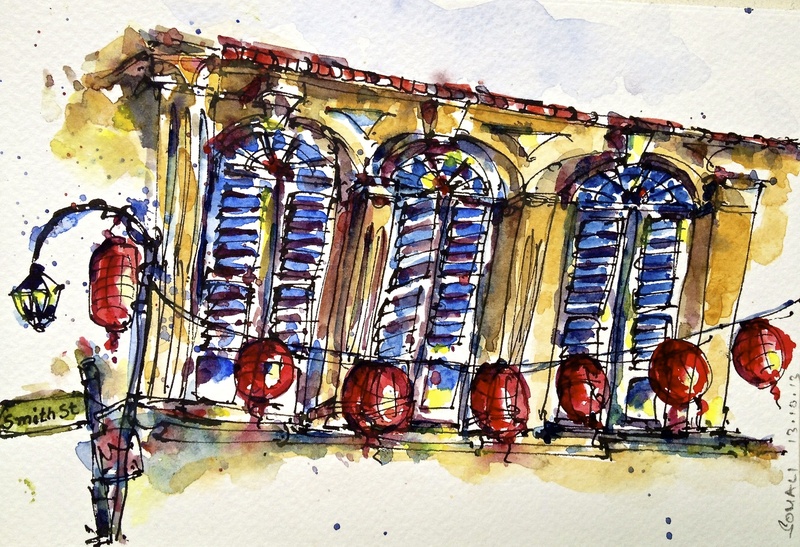 I’ll share the rest of my sketches from the trip on this blog, accompanied by little stories. Should be fun! Regurgitating and reminiscing begins. 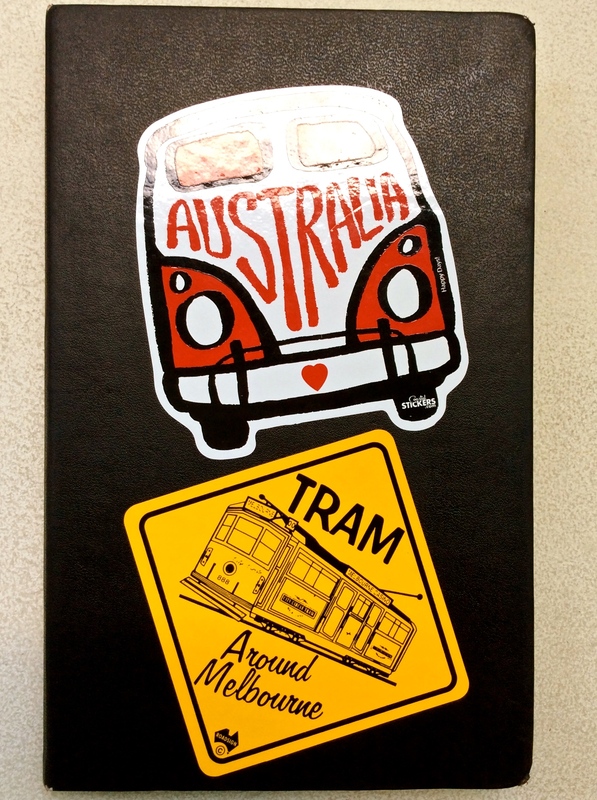 This entry was posted in Daily Vignettes, Travel Vignettes and tagged 165 gsm, Antipodean, Antipodes, Australia, Herschel, illustration, Melbourne, Moleskine, Moleskine Japanese Album, New Zealand, packing, sketch, South Island, Sydney, Travel, trip on January 26, 2015 by Somali Roy. Shopping, eating, drinking and sometimes gawking at the mind bending architecture of shopping malls is what we relate Orchard Road with in Singapore. Sitting with a book in a quiet meditative corner isn’t what you particularly come to Orchard for. Well, you can be adamant and try sitting in a cafe perhaps, burying your head in a pile of text, but what you can’t do is obstruct the relentless stream of people gushing in and out through its doors with shopping bags, the drone of their collective orders of latte and green tea jabbing your focus, their hot fervent gossips about the latest bag, gadget or underwear tingling your ears, and their restless animated bodies scuffling to find that elusive ‘perfect’ seat’ making you want to stand up and offer yours. Well, the good news is, as incongruous as it may sound, Orchard Road – the queen of glitz and glamour, has gained a public library in its armoury. And as soon as we got a whiff of the news, my friends and I rushed to check it out, sketchbooks in tow. Clearly the space wasn’t designed in a hurry – the new kid on the blocks, spanning across two floors, has lot of style and panache! One of the floors have wooden wiggly, wave shaped book racks flanked by a theatre style seating affixed with plug points and lights. Upstairs has even more interestingly designed seating areas – some with a glimpse of the streetscape, some reminding you of an airport lounge and some cozy and secluded, just the way you want it. Though primarily stocked with design and applied arts books, the fiction and cookbook section is pretty verdant. The book drop off and borrowing points are niftier and there’s a huge section of magazine drawers aligned in straight rows with lush glossy covers staring out at you, giving the impression of a heavily postered wall! While the Central Library at Bugis, still remains my mecca, this one’s a new favourite. Finally, Orchard Road isn’t all about spending anymore. 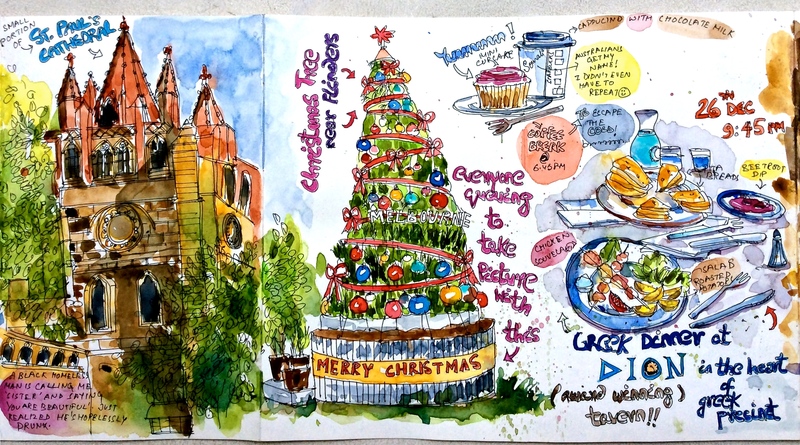 This entry was posted in Daily Vignettes and tagged applied arts, arts, cookbooks, design, fiction, illustration, Orchard Gateway, orchard road, Public library, shopping mall, Singapore, sketch, Travel on November 6, 2014 by Somali Roy.